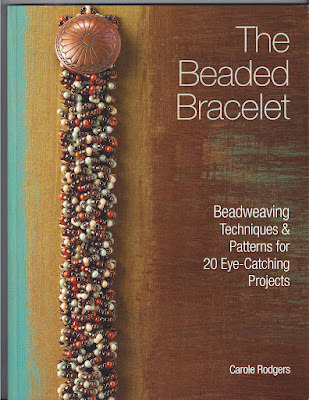 Found this really great book on beaded bracelets. Made a couple of the designs and very little modification to the instructions was required. The caterpillar bracelets that were highlighted a couple of posts ago came from this book (see book cover)as well as the one below. There are a couple more patterns that I’m going to try before I create my own versions of my favorites. These are fun little projects. Great to do while “watching” TV. The Houston Area Fiber Artists are having their annual gallery show next month (September 22 – 30) at 18 Hands Gallery in the Heights. I submitted a couple of pieces for consideration. 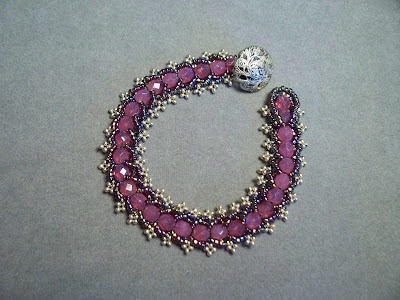 Hope to hear that one or both of these neckpieces get accepted into the show. This is Gumball. Had great fun adding all the felt bits and then very happy I found this fabulous yarn in my stash that I could use to wrap everything together. 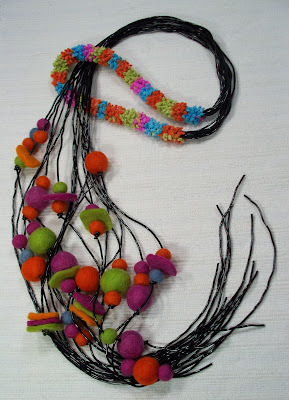 The black is plastic yarn. It looks great on and is very lightweight. This piece is called Golden Pond. It just seemed like light shimmering on golden blue water. The centerpiece is heat treated copper with an enameled accent and some of my great C-Lon cording. 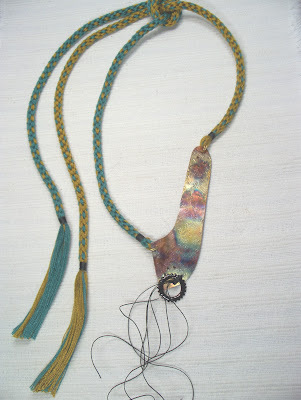 The necklace, itself, is made of fine wool fibers and braided in the traditional Japanese style (kumihimo).